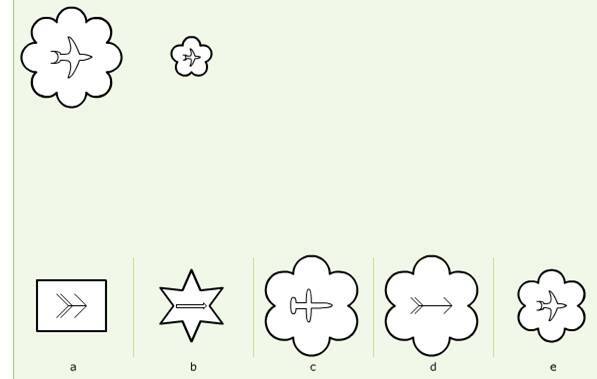 To solve these types of questions you are looking for a similarity of form or structure between 2 clue symbols and looking to replicate these elements in an answer symbol. Both clue symbols have a solid external black line – discount as looking for differences. Both clue symbols have a white fill – again, discount as looking for differences. Both clue symbols are a different size. Both clue symbols contain identical internal shapes. The fifth answer symbols internal shape matches the clue symbols. Size, external shape and size are not relevant to this answer. Only the internal shape gives us a logical clue as to which symbols are similar in form.